Flownamics has developed an automated, online analytical solution for Beckman Coulter’s Vi-CELL™ XR cell viability analyzers that can be used to meet the above criteria. The Vi-CELL™ XR analyzer can be combined with the Seg-Flow automated online sampling system to obtain a fast and rugged cell analysis PAT platform for real-time differentiation of bioprocess cell cultures. This article enumerates both the performance and attributes of the Vi-CELL™ XR-Seg-Flow integrated solution. The Seg-Flow system can be easily interfaced with all types of vessels. It collects samples from bioreactor vessels and transfers them to the Vi-CELL™ XR system. After the cell analysis is over, the Seg-Flow obtains and processes the Vi-CELL™ XR information to give real-time monitoring of bioprocess cell cultures. 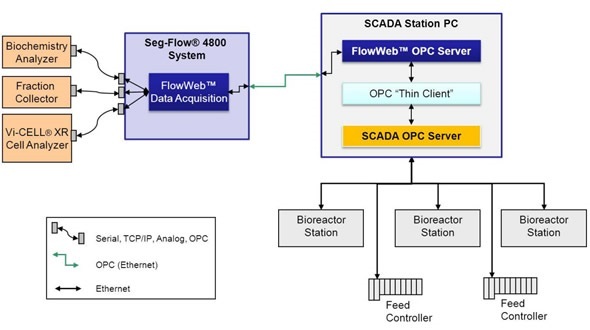 The system also includes the FlowWeb™ OLE-for-process-control (OPC) technology that makes it easy to combine the Vi-CELL™ XR data to any bioprocess management or OPC-enabled SCADA system for better and improved bioprocess monitoring and control. The Vi-CELL™ XR/Seg-Flow system is shown in Figure 1. Figure 1. The Vi-CELL™ XR/Seg-Flow 4800 automated online cell analysis system. In addition, the Seg-Flow comes with a patented segmented online sampling technology that makes it easy to deliver cell samples from the cell culture vessel to the Vi-CELL™ XR cell analyzer system. This feature not only reduces the sample processing time, but also maintains the analytical reliability of the Vi-CELL™ XR system. The Seg-Flow system also features a single-use fluid path technology that makes it possible to switch products between batches. This technology also conforms to present practices implemented across the bioprocessing industry. The Vi-CELL™ XR/Seg-Flow system can also be coupled to other analytical instruments such as fraction collectors, HPLC/UHPLC, and biochemistry analyzers to provide a complete PAT strategy for improved bioprocess management. 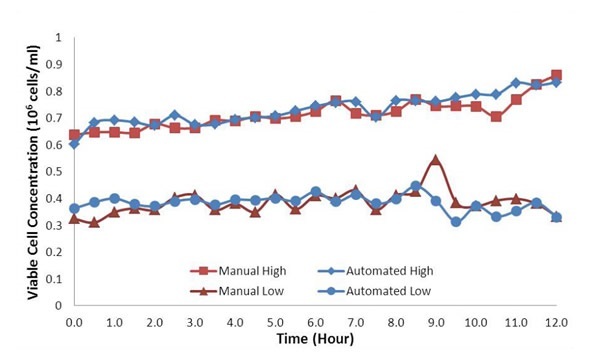 Figure 2 shows an automated, online cell culture process PAT strategy for real-time nutrient, cell, and metabolite monitoring. Figure 2. Architecture for the Vi-CELL XR/Seg-Flow integrated bioprocess PAT solution. The Vi-CELL XR/Seg-Flow interface can be integrated with additional third-party analytical technologies to provide a complete PAT solution for cell culture monitoring and control. In this study, the performance of the Vi-CELL™ XR and Seg-Flow systems is evaluated to ensure that the analytical accuracy of the former instrument is not compromised when it is combined with the Seg-Flow instrument. The experiment simulates the number of samplings carried out during a 2–4 week cell culture process and also surpasses the requirements of sample size for the Vi-CELL™ XR cell concentration specification (n=20). First, the Vi-CELL™ XR and the Seg-Flow systems were combined to conduct the automated online cell analysis. This integration makes the Seg-Flow system to manage the Vi-CELL™ XR remotely, deliver the sample to the Vi-CELL™ XR for real-time cell analysis, and recover the analytical data from the Vi-CELL™ XR system. This integration also makes it possible to perform manual sample analysis amid the automated sampling cycles. For the experiment, instead of using live cell cultures, cell concentration standards were used because of cell cultivation limitations at the testing center. These concentration standard solutions were then combined in their relevant glass vessels, and the Seg-Flow was programmed to collect samples from the vessels at a 30 minute-interval spread over a 12-hour period. Following automated analysis, the Seg-Flow system performed the cleaning and rinsing process to remove sample residue from the Seg-Flow fluid path. Manual samples were then collected and examined with the same Vi-CELL™ XR system used for automated online analyses. Overall, 25 analyses were carried out for each set of sample, which were later examined for cell viability, viable cell concentration (VCC), and total cell concentration (TCC). Measurements of Vi-CELL™ XR cell viability and cellular parameters were carried out through a default Vi-CELL™ XR cell type protocol. The standard and mean deviation of each parameter were determined for data analysis. In bioprocessing applications, three analytical parameters were observed to assess the performance of cell cultures and they include cell viability, VCC, and TCC. These parameters were utilized as performance metrics to evaluate the integration of Vi-CELL™ XR and Seg Flow systems. Figures 3 and 4A show the VCC profiles and VCC mean values for the manual and automated analyses of the low and high cell concentration standards, respectively. The analytical profiles do not show any major difference between the manual and automated samples observed for the VCC analysis during the time of evaluation. Moreover, the Vi-CELL™ XR/Seg-Flow system provided a ±2.4% average concentration precision (n=25) for the automated VCC analytical approach, which meets the ± 3.0 % Vi-CELL™ XR average cell concentration specification. Figure 3. 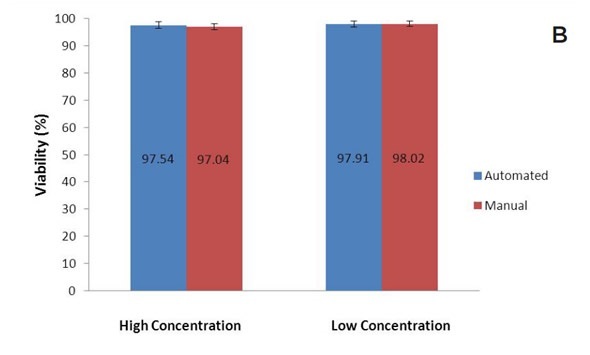 Viable cell concentration profiles for the high (0.7 x 106 cells/mL) and low (0.4 x 106 cells/mL) concentration standards. Automated and manual samples are shown in blue and red, respectively. Figure 4. 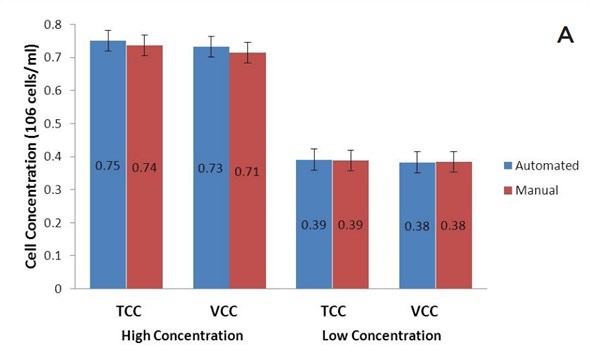 (A) Total and viable cell concentrations, and (B) viability for the high and low concentration standards. Each bar represents the mean of 25 analyses with error bars of one standard deviation. Mean TCC, VCC and % viability data for the automated and manual samples are shown in blue and red, respectively. In Figures 4A and 4B, it can be seen that the mean cell viability and TCC values were equal for both the manual and automated cell analyses. The cell viability percent variation was ±0.5 %, and the TCC average concentration precision was ±2.0%. This further confirms the analytical accuracy of the Vi-CELL™ XR/Seg-Flow system. The automated online solution allows Vi-CELL™ XR cell viability analyzers to carry out real-time cell analyses for enhanced monitoring and control of bioprocessing applications. The Seg-Flow automated online sampling and feed control system offers plug-and-play options for the Vi-CELL™ XR systems. In addition, the Vi-CELL™ XR/Seg-Flow integrated system maintains the analytical reliability of the Vi-CELL™ XR instrument, can be easily interfaced with various bioreactors, and enables Vi-CELL™ XR systems to be employed for manual testing purposes.